Not long till NEW ZEALAND'S LARGEST WORLD PARTY! Gather your friends and family together and head to one of the world's most stunning venues for a three-day celebration of music and global culture. It's really about exciting music discoveries but there are some big names (Arrested development, Tim Finn, Kimbra, Moana and the Tribe etc). The full music lineup is here with artist Bio's and audio. We actually think it's the most entertaining lineup there's been for years! Grab the stage schedule or complete info booklet here to help you decide who to see when on the weekend. Lagoon by the Bowl stage. This year there was a Band competition with the public voting on the website for the final spot to play at Womad, the winner being The Balkanistas, a 26 piece – yes 26-piece band, from Wellington. There will also be a Cinema under the trees featuring short films and Len Lye movies! WOMAD was founded in 1980 by Peter Gabriel, Thomas Brooman, Bob Hooton, Stephen Pritchard, Martin Elbourne and Jonathan Arthur. The first WOMAD festival was in Shepton Mallet, UK in 1982. The audience saw Peter Gabriel, Don Cherry, The Beat, Drummers of Burundi, Echo and The Bunnymen, Imrat Khan, Prince Nico M' barga, Simple Minds, Suns of Arqa and Ekome amongst others performing. Since 1982 WOMAD Festivals has travelled all over the world, bringing artists to numerous locations and entertaining over one million people. WOMAD New Zealand 2013 is the ninth WOMAD to be held at the stunning New Plymouth site in Taranaki. Prior to shifting to New Plymouth WOMAD NZ occured twice in Auckland. 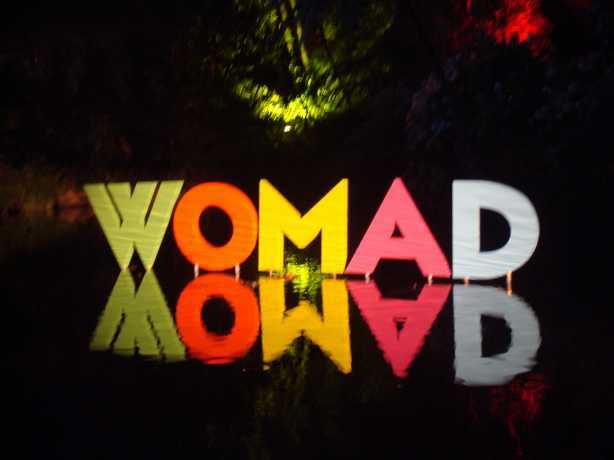 Ethos From the outset, the WOMAD name has reflected the festival’s idea; to be embracing but non-definitive, inspiring and outward looking; and more than anything, enthusiastic about a world that has no boundaries in its ability to communicate through music and movement. WOMAD has always presented music that they felt to be of excellence, passion and individuality, regardless of musical genre or geographical origin. 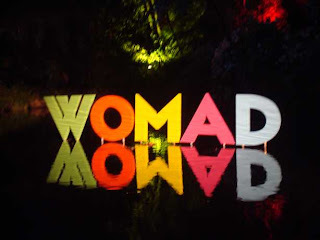 WOMAD encourages collaboration amongst the artists they invite to perform. Adult workshops are taken by the musicians and will involve dance, musical instruments and discussions. Children's workshops involve painting, circus skills, graffiti, modelling, story telling and more. Taste The World Musicians cook a choice of dish from their home country in front of an audience. 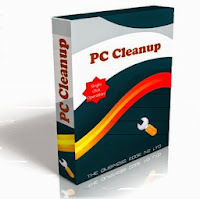 Global Market. The Global Market sells international food and wares. WOMAD in the UK takes place in the grounds of Charlton Park, a stately home in Wiltshire. The arena holds at least 8 stages with a further one in the Arboretum. An old fashioned steam fair, global market, children's area, wellbeing section is also found on the WOMAD UK festival site. WOMADelaide, Adelaide, South Australia. WOMAD New Zealand, Taranaki, New Zealand. WOMAD Abu Dhabi, Abu Dhabi. UAE WOMAD Cáceres, Extremadura, Spain. WOMAD Sicily, Sicily, Italy. WOMAD Las Palmas de Gran Canaria, Canary Islands, Spain. Cabaret noir comes to the James Cabaret as Kiwi rock stars Jon Toogood and Julia Deans join singers Jennifer Ward-Lealand and Tama Waipara to interpret Jacques Brel’s infamous songbook. A major influence on modern music, Brel’s dark, sardonic and witty songs have been covered by legends like Leonard Cohen, David Bowie and Nina Simone. Directed by Michael Hurst and featuring a stellar band led by Leon Radojkovic, Brel will move you with its raw emotion and musical power. Step into an enchanting night time world of light and sound at the Botanic Garden, as five artists transform one of Wellington’s most beautiful locations. More than a walk in the park, this spectacular array of installations has entranced audiences young and old the world over with its “sudden bursts of firefly radiance” (The Guardian). Electric flowers whirr, insects of light buzz and propane-powered Pyrophones belch flames into the sky in an unforgettable feast for the senses. Open your eyes, open your ears and prepare to be amazed. Please wear comfortable shoes. There are steep hills and steps on the walk. We recommend you do not bring buggies or strollers as the track is not suitable in parts. Return Cable Car tickets are available for $6 when you book your Power Plant tickets. Parking is very limited; please arrange to be dropped off or use public transport if possible. Fame, obsession and censorship in the brave new world of social media are examined in this hilarious and thought-provoking solo show. Based on Ursula Martinez’s own experience of internet infamy and combining spoken word and character comedy, My Stories, Your Emails is about being judged – by ourselves and the world at large. Discover the ordinary and extraordinary characters in Martinez’s life and inbox in this “cunning exploration of identity, intimacy and fantasy” (The Age). We take on The International Festival of The Arts with an interview with Yo La Tengo and music from some of the featured artists. Plus that Paul Moon interview we promised. See you at 7.30 on www.groovefm.co.nz . Check out the festival programme at the link above. Formed in late 2010, The Jac started out as a rehearsal band for students and tutors at the NZSM jazz school in Wellington, transcribing and performing charts by New York and San Francisco composers. Before long they began writing and performing their own music, and Nerve is the result, a suite of intelligent, dynamic compositions for jazz octet. Oboe and cello are rarely associated with jazz, a form that allows relatively more freedom than is usually found within classical forms. Consequently, no other group sounds quite like the Brad Dutz Quartet, which over four albums has created a body of music that is challenging, at times difficult, but always fun. Peripheral Hearing is no exception, a richly rewarding album of 21st-century music. In The Voyagers, Paul Moon tells dramatic stories of Europeans discovering and exploring New Zealand during the first half of the 1800s. Ocean adventures, cross-country trekking, imperial and spiritual conquests, first contacts with Maori, artists seeking the 'sublime', scientific discovery and commercial pursuits all intertwine to form a fascinating portrait of a land undergoing immense change. Jules Dumont d'Urville, Samuel Marsden, Ferdinand von Hochstetter and Charles Heaphy complement an array of lesser known but no less intrepid explorers - soldiers and sailors, travellers and settlers, missionaries, artists and officials - all of whom ventured from their homelands in search of new horizons. 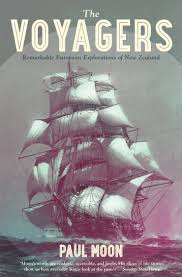 The Voyagers is a perceptive and absorbing account of nineteenth-century exploration, and of the very human characters who helped put New Zealand on the map. Celebrate Waitangi Day on the waterfront with a day of music, film, dance, craft and great kai. Join the Council and the Port Nicholson Block Settlement Trust on the waterfront to honour Te Rā o Waitangi. Soak up the evocative sounds of Whiri Tū Akā, a five-strong wahine Māori a capella group who make music that is traditional in its inspiration and has its roots in Aotearoa. Also hitting the stage are Pacific reggae pioneers Herbs, playing some of Aotearoa's most beloved songs. Chocolate Box - consisting of the very talented DJ Ayesha, Vanessa Stacey and Lisa Tomlins - are coming together to bring you a fabulous mash-up of vinyl, soul, funk and hip-hop sound. There will be plenty of beautiful craft stalls to peruse and loads of hands-on activities for the kids. Starting at 6.30pm, Films by Starlight presents Whale Rider (rated PG) on the big screen in Odlins Plaza.